This show is diverging more and more from the initial premise of its two protagonists going to war with each other, now getting ready to fight enemies from within that they don’t even realize are working against them. It did seem strange that Chuck invested so much effort in helping to fix Ira’s situation since he didn’t appear to express any remorse for what he did at the end of last season, and Ira didn’t seem to harbor any ill will towards him when he went to the trouble of having her sign a post-nup agreement and, thanks to his father’s interference, opt to stick it out with him. Chuck should have been more fully focused on taking down Jock, and the issue now is that his two most previously loyal deputies, Bryan and Oliver, are teaming up to take him down. Learning that he’s trying to topple his own more corrupt boss isn’t going to win them over since, in their minds, he’s just as bad. Axe’s method of determining comps felt very brutal, and some of the exchanges were more entertaining than others. Giving Taylor part of what they wanted happened a bit too late, and the full picture of what they were up to is now clear, signaling a huge shift that has the potential to cripple Axe Capital, especially if they team up with Gregor. Wendy making peace with Lara was a positive step for everyone, and it’s probably for the best that Lara and Axe didn’t have a romantic moment together. 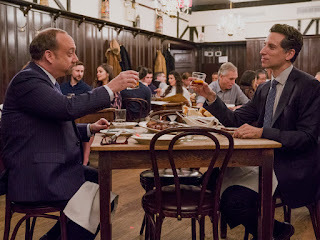 I’m not sure what to expect from the season finale, which has already aired but which I won’t watch for a while since I’m still catching up on other missed television, and I’m hopeful that it will prove satisfactory to the current storylines and enticing enough to anticipate season four.